The sign said tortillas hechos a mano but my tortillas were store bought, dry, and wilted. I ordered al pastor but they were out of al pastor so I ordered suadero, carnitas, and asada but got two carnitas, and one dreadful, fatty, tougher than wild monkey in borneo cut of carne asada. There were too many niño's running to and fro, too many flies landing on my arm and trying to land on my tacos and too many cars in the parking lot for tacos this bad. But Daniels tacos comes highly recommended. I have heard of the late night taco fiestas that stay open past 2am. The crowds that fill the parking lot, the taco wagon they wheel out at night with the al pastor spit over open flame with pineapple on top. 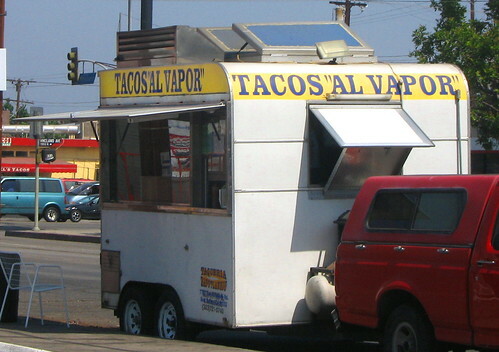 Walking back to my car I saw a taco wagon in the distance and the words tacos al vapor. It was like an oasis in the dessert. So far tacos al vapor had escaped me on this hunt. 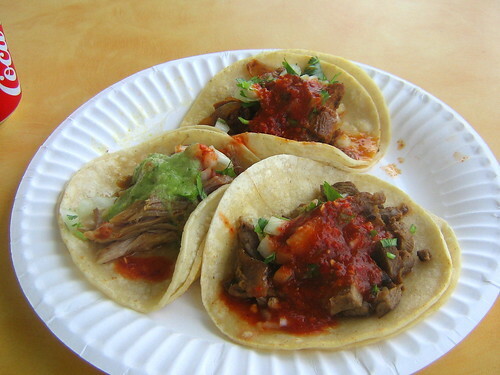 The authentic slow cooked meat only came to me in dreams and in emails from fellow taco hunters wanting to know where the elusive tacos al vapor could be found. Tacos al vapor are steamed tacos. 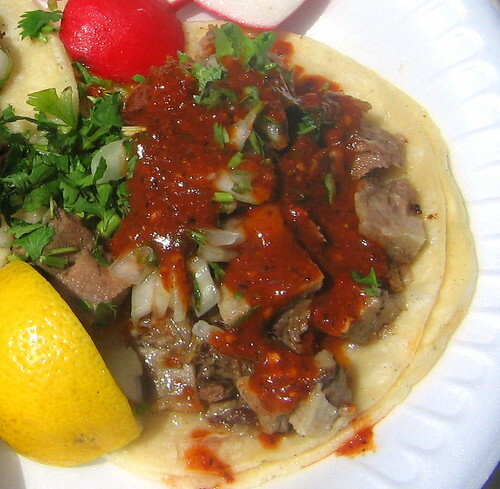 Meat,typically cabeza and lengua are pressure cooked for hours . The slow cooking process makes the meat incredibly tender and moist. Often as was the case here, the corn tortillas are steamed also. My tacos (cabeza and lengua) came con todo, with onions and cilantro. The taquero placed two squirt bottles of salsa next to my plate and I doused verde on the cabeza and roja on the lengua and dug in. The cabeza was excellent. The beefyness was toned down allowing the more subtle flavors of the meat to come out. A squirt of lemon(i prefer lime) and some salsa provided the perfect balance. Five tacos in and I was starting to hit my limit but I promised a certain taquero after trying his burrito I would return for the tacos. 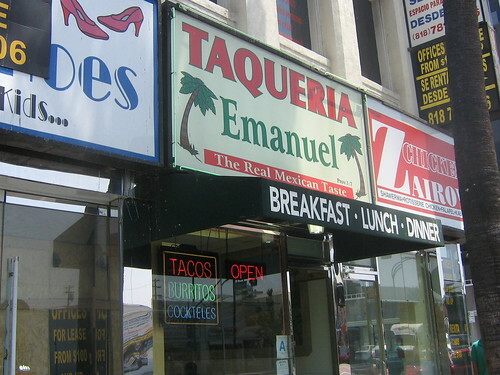 It had been a couple weeks since I was at Taqueria Emanual in Van Nuys. I walked up to the taquero looked him in the eye and threw him a curveball " burrito de carnitas con todo"
He paused at first, making note of my homemade I love tacos t shirt but I nodded in affirmation. "I will try your tacos next time my friend"
And that was that, my new friend went about preparing my burrito. Over the next 10 minutes I was to be transported to burrito heaven, with each bite a mouthful of creamy refried frijoles, soft rice, salsa roja and juicy, salty carnitas. A masterful wrap, the perfect amount of rice to beans to meat ratio and quite possibly the best burrito I've ever had. So it was on this day I returned to keep my promise. I ordered the trifecta:carnitas, al pastor, asada and sat outside with plate in hand devouring my tacos. The carnitas was just as I remembered it, full of flavor and juice. The al pastor was sweet and charred, the carne asada nice and tender with the spice from the chile salsa stinging my tongue and the coca cola adding that refreshing finish. I got back into my car and got on the 405 heading south when I heard a strange sound coming from my stomach. (A sound I had never heard before then again I had never downed 8 tacos and three sodas in such a short span of time). It sounded like a mutiny, as if my body was trying to stage a coup to end my taco extravagance. I could here the little pansavistas uniting with their anti-taco chants. I had become too decadent, pushed the limit too far, too many jalepenos, too much chile, too many tacos. But then all was quiet and a feeling of conquest came over me . My immune system was triumphant. The years of vodka swirling, jalapeño popping, and outlaw truck eating had paid off and the pansavista uprising was silenced. I have never tried any tacos al vapor before. If I have the opportunity I will definitely try some. In general this is an excellent blog. Keep up the great work. Went to Tacos Emmanuel today. 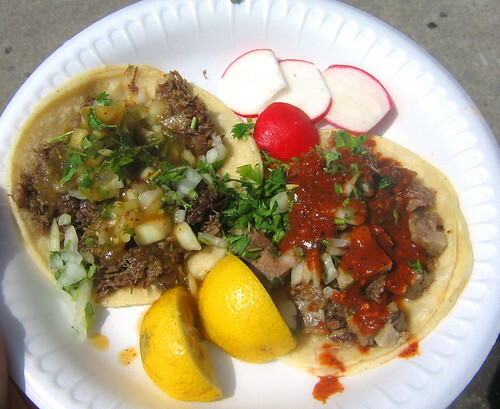 the carne asada tacos were great, probably as good as La Taquiza's. The tacos on flour tortillas were Taco Bell style with lettuce, tomatoes, and cheese. But the regular tacos! tender meat well-done. Thanks for your tip, Bandini. Growing up Jewish I was exposed to eating beef tongue early, and consumed it as a cold cut in many delicious sandwiches. Tongue used in Jewish deli sandwiches is always pickled, lending it a bright, ruby red hue, and it is usually sliced into large paper-thin slices and layered on fresh rye bread, either alone or with corned beef, pastrami or turkey. Condiments include mustard, Russian or 1000 Island dressing or cole slaw, or all of those. Cheese is not kosher with meat but is served in some "kosher style" delis. Mayonnaise can be kosher. it is nice movable trucks for showing a lots of dishes. yammi........ i like all the dishes which are must pretty. What??? I think Daniel's tacos are up there.. 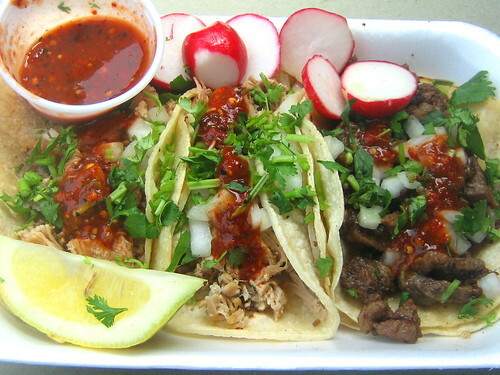 I havent been there in a while but last time i ate there i was coming back from Potreros and i ate a good quantity of them.